Several thousand yards of new hedgerow have been set & hundreds of trees have been planted on our farm. In 1996 the original ditch that carried the overflow from the Moat was widened. The aim was to form a broader, wetter 'brook' and therefore a boggier habitat which is appealing to certain birds. We seem to have succeeded, as Snipe, which feed in mud, are regular visitors. Over the past few years, since the late 1970's, Snipe numbers nationally have declined steeply in lowland grassland: this habitat. There is a field on our farm called Littlewells - until about 40 years ago it contained a small well - and it has always been a wet, difficult field to farm (Grandfather tried, unsuccessfully, to drain it in the 1960's and we tried twice, in 1979 and in 1996; both unsuccessful!). 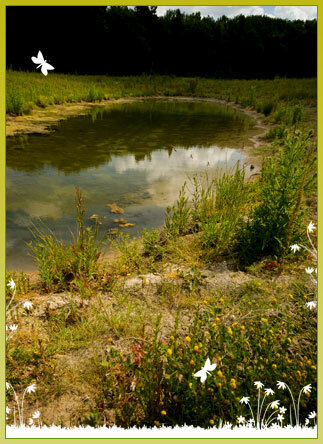 So, in 2007, rather than keep trying to beat nature, we decided to work with her and turn Littlewells into what she wanted to be - 5 acres of ponds and wetlands. Over the last 50 years or so, lowland wet habitats have suffered catastrophic losses, consequently redressing this has been one of the main aims of our conservation work. The ponds were designed (by a dragonfly expert) with various shapes and profiles, to encourage as wide a range of dragon and damselflies as possible; particularly our most threatened species; the Norfolk Hawker. The pond margins will be planted/sown with the same end in mind. Wet Lowland is one of Britain's most severely depleted habitats; so we expect Littlewells to quickly become colonized by a wide range of species that love these conditions - we had our first frog, toad and newt spawn in Spring 2009, many water living insects (water boatmen etc) have been quick to arrive and we were very excited when two pairs of Lapwings nested here in 2008, and did so again in 2009. Snipe and other waders also visit, to feed.